KNOWN for some years as a smugglers town particularly at one time for tobacco from Gibraltar, things have taken a different turn recently for La Linea de la Concepcion with increased amounts of drugs taking over from tobacco as the government in Gibraltar restricted the amount of tobacco any individual could buy or hold. With the installation of barriers at the Rio Guadarranque, it became increasingly more difficult for drugs to be transported to that area from Morocco and smugglers were forced to look for new areas in which to base their boats and unload their drugs with La Linea being a fairly obvious choice. What is obvious to drug dealers is also obvious to the authorities and since October, the National Police have been seizing RHIBS (Rigid Hull Inflatable Boats) and arresting individuals with a total in just a few weeks of 13 boats and 15 people. These 12 metre long RHIBS which are equipped with two or three powerful outboard motors are fast and relatively light so they were kept in warehouses and brought out to undertake particular trips to Morocco to collect drugs and deliver them along the coast of Cadiz before being placed back in storage. It is estimated that the value of the seized boats is some €2.6 million and as well as impounding the boats, officers also discovered large number of documents, many of which implicate a number of those arrested including those who appear to be the leaders of the criminal organisation. 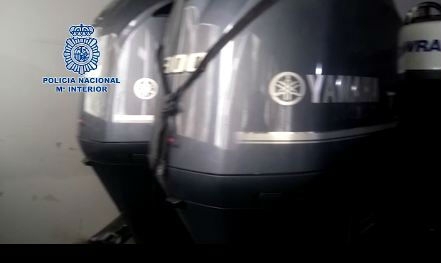 Once those involved in this alleged activity are taken to court and if convicted, it is possible that the National Police in the Campo de Gibraltar will inherit their own flotilla of RHIBS with which to counter future smugglers.